Aquaman is a reminder of the meager pleasures that can be gained from a generic superhero movie. Devoid of the complex plotting, comprehensive world-building, and narrative twists that defined Marvel's two big 2018 superhero movies, Black Panther and Avengers: Infinity War, Aquaman seems strangely out-of-step with where the genre is going. Constrained by the character's comic book origin, Aquaman refuses to do anything original or unpredictable and turns into a by-the-numbers tale of how the trident-carrying King of Atlantis becomes a protector of both land and sea. It accomplishes this by hoping that special effects saturation will compensate for screenplay weaknesses. DC/Warner Brothers is its own worst enemy. They followed up their only legitimate hit in recent years, Wonder Woman, with the execrable Justice League, which apparently nailed shut the coffin of DC superhero team-ups. Aquaman comes across as an afterthought - a "gee, maybe we should give this guy an origin story" apology to audiences looking for something more from a superhero who looks suspiciously like Kal Drogo. There are things to like about Aquaman but it's no Wonder Woman and often seems to be trying too hard. Also, with more and more superhero movies addressing social issues (most notably Black Panther), Aquaman decided to stake out its claim by addressing humanity's pollution of the oceans. While that's not a bad cause, it feels shoehorned in. 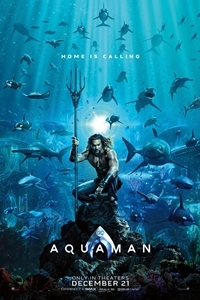 The movie opens with a prologue narrated by Arthur/Aquaman (Jason Momoa) about how his mother, Queen Atlanna of Atlantis (Nicole Kidman), and his father, lightkeeper Tom Curry (Temeura Morrison), met, fell in love, and had a little inter-species baby. When the Atlantians come calling, wanting their queen to return and fulfill her part of an arranged marriage, she goes back to protect her husband and young son. That boy grows up to be a strapping man with extraordinary strength, speed, and resistance to weapons. In flashbacks, we see him training with Viceroy Vulko (Willem Dafoe), who has been tasked by Atlanna - now dead after being sacrificed by her Atlantian husband to the "trench monsters" - with Arthur's safety. Skipping to the present day, we learn that Arthur's diabolical half-brother, King Orm (Patrick Wilson), is planning a war against those who live in the world above. He is joined by another of the underwater rulers, King Nereus (Dolph Lundgren). Secretly in opposition, Vulko dispatches Nereus' daughter, Princess Mera (Amber Heard), to seek out Arthur. The plan: have him find the sacred relic of the first king of Atlantis and, with that magical trident in hand, challenge Orm for the throne. Things don't go as planned. Following a resounding defeat at the hands of his half-brother, Arthur goes on the run with Mera. They are pursued not only by Atlantis' finest but a revenge-obsessed pirate (Yaha Abdul-Manteen II), who, outfitted with prototype armor and weapons supplied by Orm, calls himself "Manta." That's a lot of plot for one movie and the film moves too fast for its own good. There are numerous missed opportunities where a slower, more deliberate approach might have been more efficacious, limiting the repetitive vibe of the quest-style narrative. The back-and-forth bickering/verbal foreplay between Arthur and Mera occasionally feels forced. They're not Tracy and Hepburn. Jason Momoa, although charismatic and physically gifted, isn't well-suited to this sort of repartee. Amber Heard is worse, looking like a live-action Ariel wannabe who has a tendency to deliver her lines in a monotone. Director James Wan, known far and wide for horror movies, uses one of the staples of that genre in Aquaman: the jump-scare. However, instead of having a cat leap out from behind a curtain, here it's an explosion. On at least three occasions, a seemingly-sedate moment is interrupted by a pyrotechnic blast loud enough to be heard halfway round the world (and likely a couple of theater auditoriums away). There's a law of diminishing returns for this sort of thing. The first time, it's unexpected. By the third instance, it's grounds for a drinking game. The special effects, although not always special (as is sometimes the case with CGI overuse, there are times when its obvious the characters are digital representations rather than actors), are numerous. From Finding Nemo refugees to the twisted monsters of the trench, Wan populates the screen with as much bang as he can get for his buck. To his credit, the action sequences are generally well-executed (although some of the frenetically paced battles can be difficult to follow) and representative of the high-octane approach directors have taken to superhero smackdowns. Comparing Atlantis to Black Panther's Wakanda - two alien places that exist both within and apart from the "real" world - there's no question which comes out better. More time, patience, and skill was invested by Ryan Coogler in his world-building than is evident in the scattershot approach in Aquaman. Wakanda feels "lived-in"; Atlantis does not. The care employed in establishing the reality of the former setting isn't evident in the latter, which relies almost exclusively on CGI. Atlantis is often pretty and at times breathtaking but the film's focus on visual elements detract from its ability to establish something that's more than just an animated locale in which the live-action actors can play. Perhaps the biggest problem for Aquaman is timing. Had this movie arrived as recently as two years ago, it might have been heralded as a higher-end superhero movie. Things have changed, however, in both the DCEU and the MCU. Wonder Woman raised the bar then Black Panther elevated it more. Aquaman doesn't stand well side-by-side with either and that makes it a mild disappointment for comic book fans and another potential stumbling block for those who are trying to raise DC's stable of heroes to the same level as Marvel's. Aquaman's box office may warrant a sequel but this doesn't represent a step forward for superhero movies.